GET Engineering is proud to announce the industries only STANAG 4156 PMC Serial Interface Adapter. It is fully compliant to the ANSI/VITA 20‑2001 Conduction Cooled PMC Standard. 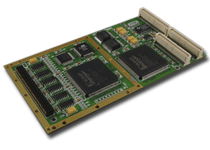 This interface adapter card offers a full duplex serial data path which can be configured to operate as a Terminal, User or Direct Connection Coupler device. Both STANAG 4156 Type A and B protocols are fully supported. All configuration parameters are accessible through a simple software interface with FPGA‑controlled DMA channels to reduce host CPU overhead. GET Engineering’s STANAG 4156 card is available in either commercial or extended temperature ranges with the option of front panel (Micro‑D 25 pin) or rear I/O through a PMC P4 connector. The software included with this adapter card provides the user with an operating system independent API enabling easy migration from one operating system to another; for example, from Linux to HPUX.